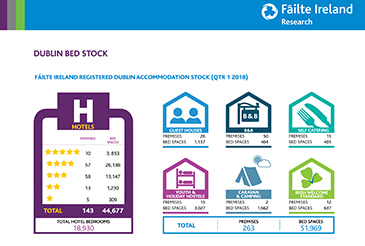 Growing demand for hotel bedrooms will still outpace improving supply in Dublin as far out as 2020, Fáilte Ireland has warned. The capital will still be short of 1,100 rooms by that stage, it found in its new report, An Analysis of Tourism Accommodation in Dublin. The analysis, carried out by Fitzpatrick Associates Economic Consultants , estimates that from 2018-2020, a total of 5,436 hotel rooms will come on stream, including over 3,000 already under construction, representing – by Fáilte Ireland’s own estimates – private sector investment in Dublin of €815m. Among the developments expected up to 2020 two out of three of the additional rooms will be in new hotels, approximately 40pc will be in the Dublin 2 and 4 area, and one in seven in the Dublin 1 prime area (the North Docks and along the route of the Luas extension in O’Connell Street and Parnell Square). The rest of Dublin 1 and Dublin 8 account for over 1,500 of the projected new rooms. Another 460 rooms are expected at, or close to, the airport, an area that experienced the highest levels of occupancy across the entire Dublin region in 2017. Fáilte Ireland estimates that every additional 200 bed hotel generates tourism revenue of €9m, creates 180 jobs and contributes €2m per annum to Exchequer earnings. The additional hotel bedrooms expected to 2020 should generate approximately 5,000 jobs, €250m in tourism revenue and €55m annually for the Exchequer. “Dublin is the gateway to Ireland with most visitors choosing to spend part of their stay in the city. Therefore, if visitors cannot access Dublin, it is highly likely they may not visit the country at all. That is why capacity in Dublin is not just an issue for the city but affects all who work in tourism – whether in Kerry, Louth, Waterford, Donegal or any point in-between,” said Fáilte Ireland CEO Paul Kelly.